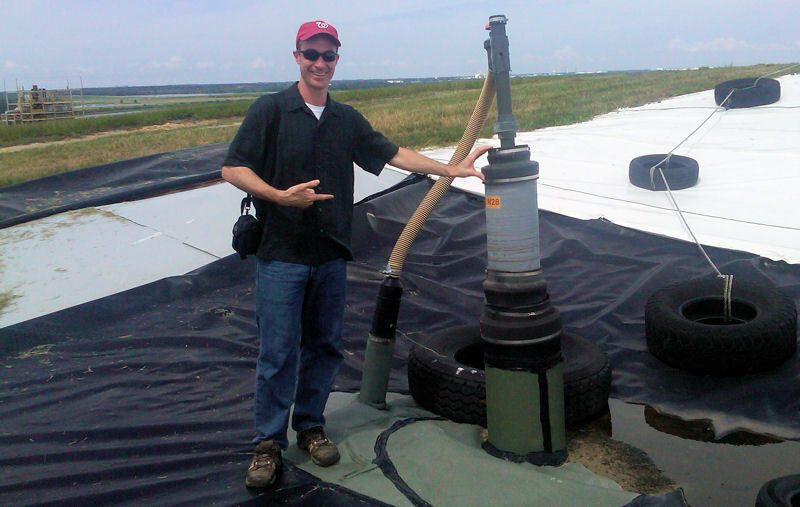 Matt Ries, chief technical officer at the Water Environment Federation (Alexandria, Va.), stands next to a gas extraction device on top of the Polk County (Fla.) bioreactor landfill. Photo courtesy of Ries. Matt Ries, chief technical officer at the Water Environment Federation (WEF; Alexandria, Va.), spends his days working to find and connect WEF with the newest and best wastewater treatment innovations around the world. This pursuit continues into his personal life, too. Ries spends much of his free time learning even more about these innovations during his pursuit of a doctorate in civil engineering from the University of South Florida (USF; Tampa). As part of his Ph.D. program, Ries participated in the Biological Waste to Energy Technologies (BioWET) conference, July 16–20. Speakers from around the United States and Europe gathered at the conference, held at USF, to discuss waste-to-energy technologies. 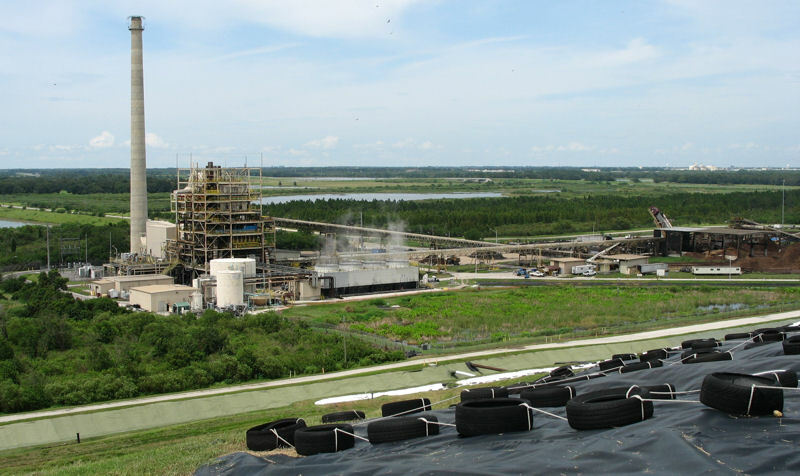 During his participation in the Biological Waste-to-Energy Technologies (BioWET) conference, Ries visits the wheelabrator waste-to-energy facility at the Polk County municipal landfill. Photo courtesy of Ries. The conference officially kicked off the BioWET project. USF is partnering with UNESCO-IHE (Delft, Netherlands) and Institute of Chemical Technology (ICT; Prague) to host this EU-funded project. During the next 4 years, ICT and IHE will send faculty and students to USF on extended visits to research the BioWET topic. Project investigators are Jan Bartacek and Pavel Jenicek from ICT; Piet Lens from IHE; and Daniel Yeh and Sarina J. Ergas from USF. Ries learned about converting sugar into biofuel and witnessed this progression of sugar cane residual converting into ethanol during the BioWET conference. Photo courtesy of Ries. Ries and his fellow students gave presentations alongside the conference’s featured speakers, who included Caitlyn Butler, University of Massachusetts (Amherst); George Philippidis, USF Polytechnic; Debra Reinhart, National Science Foundation (Arlington, Va.); and Ann C. Wilkie, University of Florida–Institute of Food and Agricultural Sciences (Gainesville). Topics included biofuel generation from biomass and algae, energy production from wastewater treatment processes, anaerobic membrane reactors, dry fermentation of solid wastes, wastewater treatment for reuse, biogas harvesting from livestock wastes, microbial fuel cell technologies, and bioelectrochemical systems. Ries presented on WEF’s programs to assist wastewater treatment facilities in becoming net-zero energy users and potential energy producers. He, along with his fellow students, visited a bioreactor landfill, wastewater treatment plants, and an algae bioenergy laboratory. 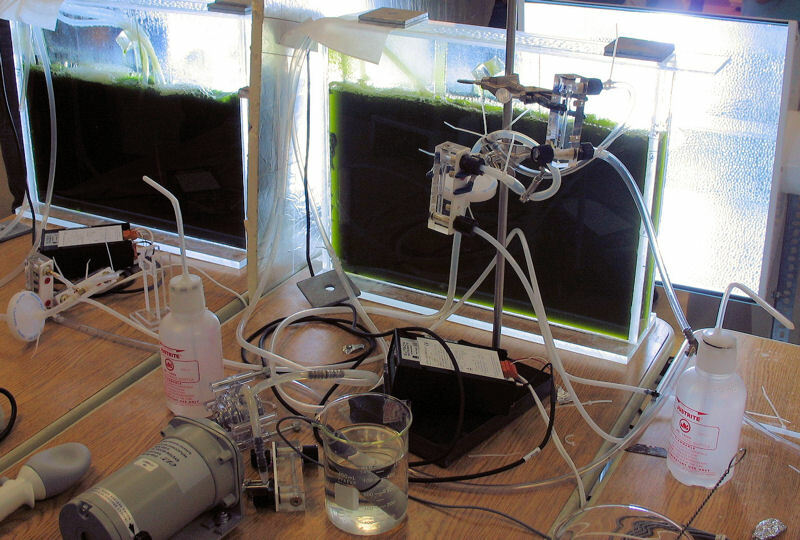 During the conference, Ries visited the University of South Florida – Lakeland Algal Biofuels Laboratory. Photo courtesy of Ries.